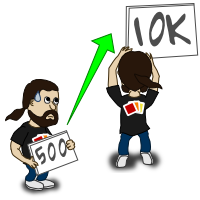 On the drive to 10K images for the Open Clip Art Library, with all its nasty bumpings, I reached a personal milestone: my 500-th clipart uploaded. It is not by any means an artistic achievement, is just a re-upload from the old site and it is an image I made (but never used) for another project and re-purposed it to the library a few years ago. But is a round number and a good opportunity to rejoice. I have in the queue some more re-uploads, about 75 images, so the increase can be notable in the following days if I will got the time (and also reinforcing my rank), but there is no way in hell I would try do displace John Olsen, with his mighty 2016 uploads, from the top spot.